Our PVC Injection molded boots are 100% waterproof and are ergonomically designed for maximum comfort. These boots feature a seamless molded construction that uses two different compounds to provide an extra soft upper, with a long wearing, slip resistant sole. 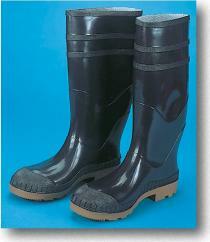 Our PVC Boots have a mildew resistant liner and are reinforced at critical points. Choose Our Black boot for all of your construction, concrete, landscaping and agricultural needs. Available in both plain toe and steel reinforced toe in men’s full sizes 7-13.